The furora film festival is a festival for film makers. 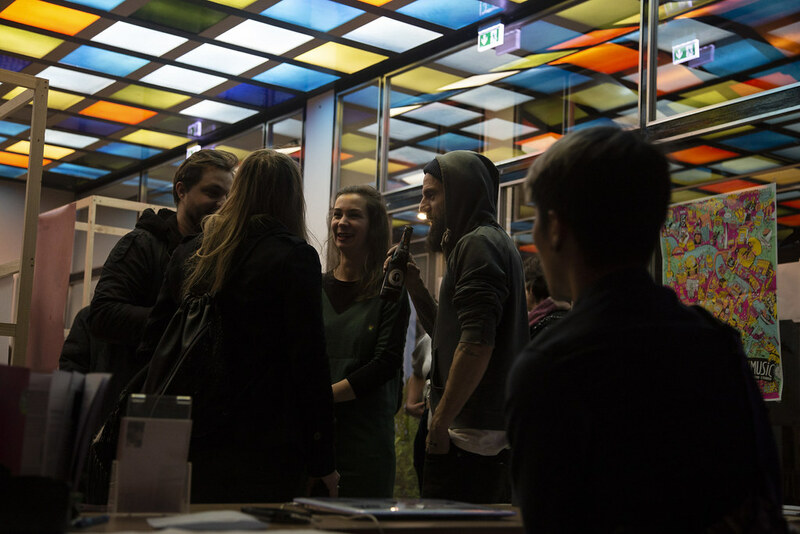 Regardless of wheter student, alumnus or young professional: The furora film festival is a platform for all those, who start out on their career and want to do do networking. Our Furora Film Festival took place on december 7th and 8th for the very first time. During this two days, City Kino Wedding and some rooms of Centre Français transformed into a feminist place of meeting and encountering with feminist topics. Around 300 persons visited the film screenings and approx. 50 women participated in the framework programme. Further visitors came to see the poster exibition in the cinema foyer. We were really happy to welcome 10 of the 17 emergent filmemakers whose films were shown in our feature and shortfilm programme, and also to have 10 female experts from film business for presenting and realising the speed dating brunch, the two workshops and the talk. Fun fact: During the speed dating brunch we cooked half a kilo of coffee! We really enjoyed the atmosphere during the whole festival! Most of the attendees didn't knew each other before, nontheless we experienced an open, trustful, inspiring atmosphere. Visitors who originally just wanted to stay for a short view were drawn in by the ambience of the festival and spontaniously stayed longer or even came back again for another screening program. The Furora audience was diverse and international: younger and older people, men and women, original Berliners and new Berliners and international guests came together. Therefore we reached our first goal – to appeal to a wide audience. Highlight of the content-releated networking was our framework programme on saturday. First we started with a speed dating brunch with a lot of tasty food in the cosy ambiente of the cinema foyer. It was such a great success that the participating women stayed even hours longer than planned to continue talking about work experience in film business and connecting for further projects. In the afternoon, we offered two workshops which were fully booked out in advance and from which we got a positive feedback. A real enrichment beside the exchance between the filmemakers were the cooperations with artists from other creative sectors: The carefully realized poster exhibition 'Furora x Posterwomen' and the feminist art by 'Crafts and Cramps' were an inspiration to us and a colourful extension to our programme. Thanks to your great support in form of your numerously attendance and the financially aid through the crowdfunding campaigne we could end the Furora Film Festival in the black. For a cultural project without any official sponsor or grants from public founds this is neighter easy nor naturally. We are really thankful for this support and all the new contacts we made through Furora. For this, we want to say thank you to all of you! This festival showed us that our idea has worked and that there is a need for projects like Furora. With this knowledge we will think about the future of Furora after our deserved after-festival-break. So stay curiously and stay tuned! If you have any feedback, ideas, wishes or critic relevating the festival (or further projects) please write us to info@furorafestival.de! We are looking forward every mail. As in most other fields, women* also in the film industry have to struggle with different forms of discrimination. According to a study by the German institute for film funding (Filmförderanstalt) half of the film school graduates are female but only get 10% of the funding. The remaining 90% go to their male colleagues. Women* in the film industry, especially in the key positions, are clearly underrepresented. Only every 5th German movie that is shown at the cinema was shot by a female director. It’s quite clear that these circumstances make it very difficult for female* film school graduates to assert themselves in the motion picture industry. In order to make that easier for female filmmakers, we have to create platforms where they can show their work at the very beginning of their career. On the other hand, we need to open a space where women* can build up a network. In this way, they can appear as a unity and their demands get more attention. Our festival pursues these two approaches. No other film festival in germany shows exclusively films made by female* students and beginners. With the furora film festival we aim to improve the self-awareness of new female* film makers. At the same time, we want to create a space for networking among women*. the FIBRA Frauenverein e.V. to organize networking events. We bring experienced film makers and beginners together. developed the concept and organize the Furora Film Festival. The organisation is divided into different responsibility areas. Volunteers will support the team during the festival time. Berlin" and "La Vie en Toast"
"Can you see me if I shout?" You'll find all important press materials to download here. If you need further information or press images, you're welcome to contact Nina Grabowski at nina@furorafestival.de. Thanks to all crowdfunding-supporters* who made this project possible!